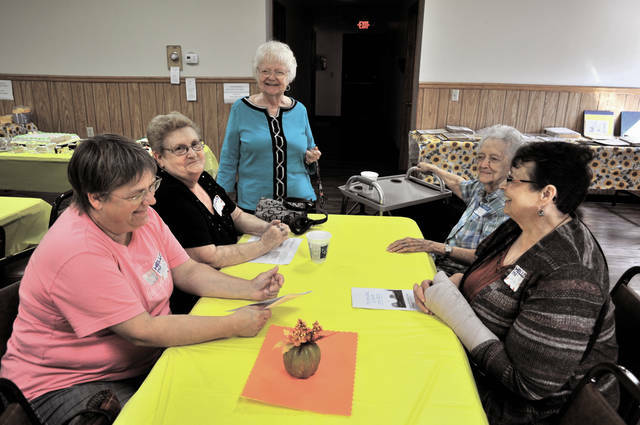 Cecilia Fox | AIM Media Julie Segi, Karen Foster, Sadie Thiele and Pam Schmidt are regulars at the center and they encourage more residents of all ages to stop by and check out the events. Roberta Imes, standing, stopped by Sunday to visit friends. Cecilia Fox | AIM Media Activities Director Carol Garver shows off some of the scrapbooks of pictures and clippings collected during the center’s history. WEST MILTON — Last weekend, the Milton-Union Senior Center and Community Club opened its doors to the community like it would any other day, but this time in celebration of it’s 50th anniversary as a non-profit organization. The center celebrated the occasion with a luncheon, raffles, tours of the building and plenty of cake. Center regulars Julie Segi, Karen Foster, Sadie Thiele and Pam Schmidt said they hope more people take notice of the center and what it offers the community. “It’s not just for seniors, you know,” Schmidt said. The center also put out displays from its history, including scrapbooks filled with articles and newspaper clippings. Many of the clippings detailed the organization’s efforts to build its current home. Activities Director Carol Garver dug up artifacts from the center’s history, including a coffee can used to collect donations for the building fund and a poem meant to encourage donations. 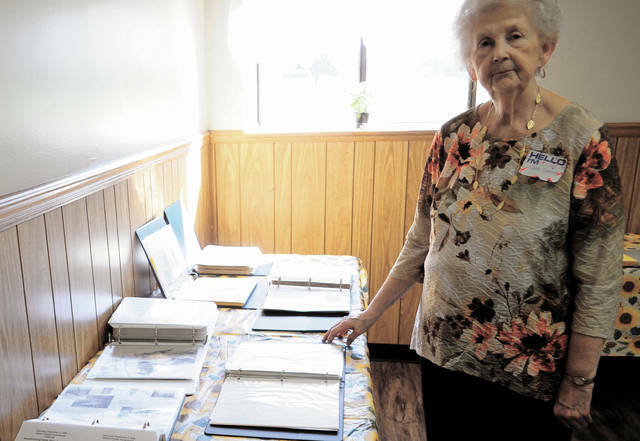 A small group of seniors started meeting in homes and and in the community room of the First National Bank & Trust in 1967, with hopes of finding a permanent location for a senior center. It was incorporated as a non-profit organization 50 years ago. In recent years there have been several improvements made to the center, which were made possible through donations and grants, Garver said. In 2015, a local Eagle Scout repainted the building. Other recent improvements include renovated bathrooms, new floors, windows and a roof, and automatic doors. The center is still raising funds to pay for the building’s new roof. Several baskets were available for raffle at the open house, with the money going toward the roof fund. The center, which is an all-ages community space, hosts a variety of events like bingo, card games and health screenings. Groups from the center also go on trips, including a recent excursion to the Spangler Candy factory in Bryan, Ohio, where Dum Dum suckers are made. The center hosts a carry-in luncheon on the second and fourth Wednesdays of the month, except in November and December, when they meet on the second Wednesday only. After lunch, there is bingo and a speaker. Every Friday night is euchre night, which is open to the public. Doors open at 5 p.m. and euchre starts promptly at 6 p.m.
For more information about the center, call (937) 698-7129 or visit the Milton Union Senior Center & Community Club Facebook page.  https://www.weeklyrecordherald.com/wp-content/uploads/sites/51/2018/10/web1_seniors_cmyk.jpgCecilia Fox | AIM Media Julie Segi, Karen Foster, Sadie Thiele and Pam Schmidt are regulars at the center and they encourage more residents of all ages to stop by and check out the events. Roberta Imes, standing, stopped by Sunday to visit friends. Cecilia Fox | AIM Media Activities Director Carol Garver shows off some of the scrapbooks of pictures and clippings collected during the center’s history.